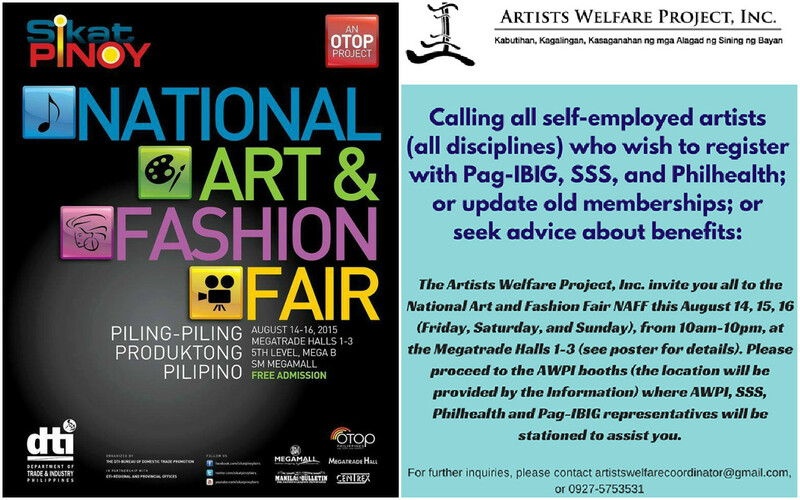 The Artists’ Welfare Project, Inc. (AWPI) is participating in the National Art and Fashion Fair organised by the Department of Trade and Industry (DTI) to be held at SM Megamall Megatrade Halls 1-3 on August 14-16, 2015. The AWPI Booth is open from 10 AM – 10 PM. Besides the display of artists’ merchandise, the booth also caters to AWPI Membership Registration as well as to Social Welfare Registration. Since early this year, AWPI has partnered with SSS, PAG-IBIG and PhilHealth to make artists’ registration, pension counselling as well as loan counselling easier for artists and cultural workers, majority of whom are freelancers if not contractual/seasonal employees. 3) Philhealth, SSS, and Pag-ibig nos. SSS monthly contributions (minimum: PHP 120 / month) will be paid afterwards at SSS-credited banks, or at payment centers, or at SSS branches. 1) Please bring any valid ID. The minimum Philhealth contribution for self-employed artists is 600.00, covering for one quarter. One may also opt to pay 1,200.00 (bi-annual payment for the self-employed); or 2,400.00 (annual payment for self-employed). 2) Accomplished form downloadable at PAG-IBIG website or available at the AWPI booth. The minimum contribution is a minimum of 200.00 per month, with options to pay quarterly (600.00), or bi-annually), or annually (2,400). The Artists Welfare Project Inc. is a non-stock, non-profit organization registered with the Securities and Exchange Commission in 2007. It was set-up by a group of Filipino artists from various disciplines in an effort to contribute to artists’ wellbeing by 1) tapping into government agencies that provide welfare benefits to Filipino citizens; and by 2) pushing for legislation that will provide long-term solutions to Filipino artists’ vulnerable conditions. This entry was posted in Advocacy and tagged Actors' Equity, Art Fair, Artists Guild, Artists Rights, Artists Solidarity, Artists Union, Artists Welfare, Artists Welfare Bill, Artists Welfare Project, Arts, AWPI, CCP, Concerned Artists of the Philippines, Cultural Center of the Philippines, Cultural Rights, Cultural Studies, culture, Democratic Rights, Department of Trade and Industry, DTI, Fashion Fair, human rights, Humanities, insurance, kultura, Manila Bulletin, Megatrade Hall, National Commission for Culture and the Arts, NCCA, One Stop Shop, One Town One Product Marketplace, OTOP, Pag-ibig, pension, performance studies, philHealth, Philippines, sining, SM Mall, SM Megamall, SSS. Bookmark the permalink.